This outstanding book provides an in-depth historical study of the place of Jesus in the religious life, beliefs, and worship of Christians from the beginnings of the Christian movement down to the late second century. Lord Jesus Christ is a monumental work on earliest Christian devotion to Jesus, sure to replace Wilhelm Bousset’s Kyrios Christos (1913) as the standard work on the subject. 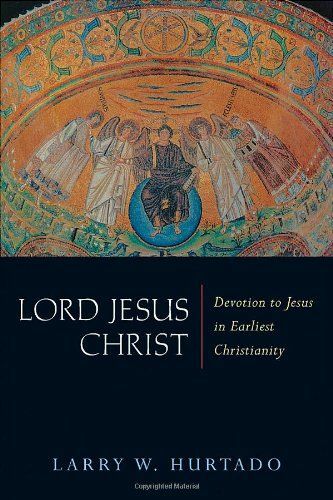 Larry Hurtado, widely respected for his previous contributions to the study of the New Testament and Christian origins, offers the best view to date of how the first Christians saw and reverenced Jesus as divine. In assembling this compelling picture, Hurtado draws on a wide body of ancient sources, from Scripture and the writings of such figures as Ignatius of Antioch and Justin to apocryphal texts such as the Gospel of Thomas and the Gospel of Truth. Hurtado considers such themes as early beliefs about Jesus’ divine status and significance, but he also explores telling devotional practices of the time, including prayer and worship, the use of Jesus’ name in exorcism, baptism and healing, ritual invocation of Jesus as “Lord,” martyrdom, and lesser-known phenomena such as prayer postures and the curious scribal practice known today as the nomina sacra. The revealing portrait that emerges from Hurtado’s comprehensive study yields definitive answers to questions like these: How important was this formative period to later Christian tradition? When did the divinization of Jesus first occur? Was early Christianity influenced by neighboring religions? How did the idea of Jesus’ divinity change old views of God? And why did the powerful dynamics of early beliefs and practices encourage people to make the costly move of becoming a Christian? Boasting an unprecedented breadth and depth of coverage — the book speaks authoritatively on everything from early Christian history to themes in biblical studies to New Testament Christology — Hurtado’s Lord Jesus Christ is at once significant enough that a wide range of scholars will want to read it and accessible enough that general readers interested at all in Christian origins will also profit greatly from it.